Four days of SUN, SAND, and RELAXATION in a brand NEW Oceanfront resort just a few blocks from the famous Ocean City boardwalk. Upon arrival, if you decide to leave the amazing Double Tree property and all its amentities, you can enjoy the beach, stroll the baordwalk, or shop to your heart's content. Ocean City has much to offer, and hotel concierge will be able to assit with planning all your excursions. Passengers will take a short coffe break enroute, then arriva in Ocen City at approximately 11:30 am. There is a rest room/changing room available in the resort for those wishing to speand time on the beach prior to check-in. All rooms will be ready for guests at 3:00 pm. check out time is on Thursday at 11:00 am. Passenger luggage will be picked up at that time. 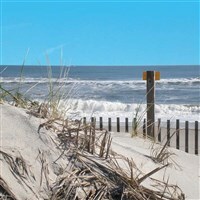 Guests will have free time until 3:00 pm on the fourth day to enjoy Ocean City. A $100 non-frefundable deposit per person is due at time of booking. Final payment is due no later than Friday, August 2, 2019. Deluxe Motorcoach Transportation, four days and three nights ocean fron accommodations at the Double Tree by Hilton.